We refer to Spirit as Life-Spirit and our definition is: Spending quality time with others in the great outdoors. Being part of the Martial Science is a lot more than just learning the martial arts. A unique way to look at us would be as Ninja Scouts (as in Boy Scouts and Girl Scouts). We encourage students to get together for adventures that include hiking, camping, climbing, travel, multiple terrain training and more. This is one of the reasons we run our camps in places like Thailand and run adventure programs in National Parks like Yosemite or Travel and Training programs in New Zealand. You can take a step closer to nature and take part in adventures that will last a life time. A large part of the Martial Science is devoted to the outdoors and outdoor activities. As children we spent much of our time exploring and discovering. We want to recapture and maintain that healthy attitude we had when we were young. Life should include fun and games, regular adventures, and new experiences that combine both the world and humanity. To be happy, we need to be challenged. We need to set goals and strive towards their achievement. In keeping with our desire to seek out and overcome obstacles students get together for outdoor adventure. Travel and Adventure is a great addition to your Martial Arts training. It is best if you have and maintain a healthy outdoor adventure attitude along with a respect for nature and the living world that surrounds us. You can get together with other students and practice everything you need to know to be a confident and competent mountaineer. Everything from tying knots to using technical gear. With other adventurers you can get hands on experience in many of the worlds best climbing locations like – Yosemite, Joshua Tree or how about climbing on a tropical island in Thailand? Rock climbing offers each one of us a challenge and opportunities for working as a team. This challenge is what we believe to be the healthiest form of competition. You are competing within yourself, not other people. One of the great things about rock climbing is it truly allows for living in the moment. To live in the now. When you are on the side of a rock face, your focus in on exactly what is happening right then and there. It is truly and enlightening experience. Rock climbing is also a great excuse to get outside and travel with a group of like minded people who are looking for some adventure. Whether you are an absolute beginner just starting out or an expert climber there is always something for everyone. Many of our students were introduced to Rock Climbing through CMS or the Martial Science and then went on to include it as a regular activity into their lives. 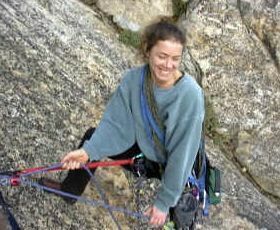 Some were even able to get jobs as rock climbing instructors. No outdoor adventure program is complete without a moderate amount of hiking and camping. Although camping will be included on a number of our other activities, the traditional hike-camp-hike-camp strategy will be implemented. We will designate locations of interest and hike to them. There will be easy hikes and difficult hikes. We will have comfortable camp settings and we will have survival camp settings. Be prepared for both. You may begin to understand that Adventure is not just a word, but something far more spiritual. 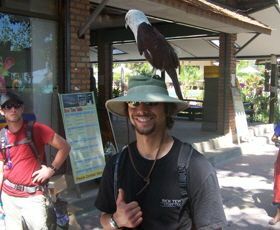 If you have the Adventure Spirit, you will feel right at home with the all of our programs. The purpose of our program is to get out and explore with a group while developing life skills through training in the martial arts. 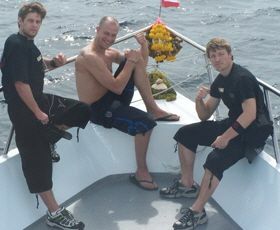 On the Travel & Training program students will have the opportunity to be out and about on a daily basis. These days include biking, hiking, scrambling, camping, and other outdoor adventures like rock climbing, bungee jumping, kayaking and rafting. Since we focus on the martial arts you will be expected to work with us on adventure trips with other members. We will do our best to ensure that things run smoothly. Students on our U-CAN California Tour will train at the beach, hike through popular movie sets and dodge slots in Las Vegas. Expect to spend time at various National Parks as well as getting the chance to develop your leadership skills by teaching what you learn to other students. In addition to California Tours we organize travel and training programs in Thailand, New Zealand, Mexico, Europe, and Hawaii. To learn more about the Southwest United States Tour or some of the locations outside the contiguous United States – fill out the sign up form and someone will get back to you as soon as possible. 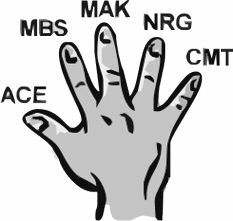 The Martial Science / Ninjitsu is a combination of effective usable principles that makes it into an elite system. Students who take part in this intensive program will be trained in the system from and programs that Rick Tew’s Martial Science / Ninjitsu has to offer. This program is available for beginning to advanced students and adventurers alike. Members also participate in exclusive “Sensei Seminars” where Sensei Tew teaches a solid amount of skills and techniques in a unique environment. This is just a small list to inform those who have not read through the RTMS training programs. A variety of the Martial Science training will be taught during your travel program. We are capable of teaching all levels and ranks regardless of age or previous martial arts background. For more information regarding the Martial Science, refer to the RTMS page. 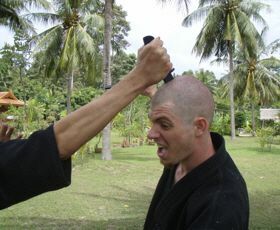 The basic techniques of Tew’s Martial Science encompass a wide range of activities and instruction that are both realistic and effective. Body movements, punches, kicks, rolls, and falls are all integral components of hand-to-hand combat. Eventually, after several years of training, you will begin to develop your own style that is tailored to your personal strengths and weaknesses. If your dream is to become an instructor and to help teach and travel with Rick Tew’s Martial Science and TTT then you should consider our Total Warrior program or our Teach in Europe course which gets you started in only 2 months. The training you will endure is a vehicle to achieving an improved self-worth. Our motives are drawn from our desires for happiness, freedom, and adventure. The RTMS way of life will always be with you in training or in spirit. We look forward to sharing with you the adventures and joys of a lifetime and welcome you to the organization dedicated to giving you the best. We really believe in the Mind, Body, Spirit approach for overall success. 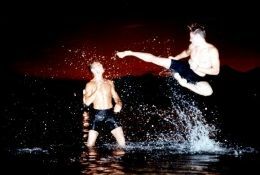 Even though training in the Martial arts offers a high level of joy and excitement, we also need focused mental growth. 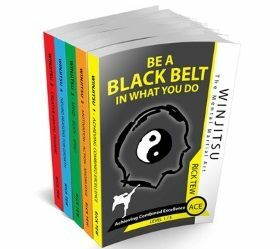 One of the ways that we provide this focus and growth is through a system Rick Tew has developed and what he calls WINJITSU – the mental martial art. In this day and age, your mental skills will take you a lot further than your physical skills. This is unless, of course, you are among the 1% that has made a success out of putting a ball through a hoop. But even these top-ranked athletes will tell you that their ability to perform is largely based on their mental skills; their “Mental Martial Arts,” and this is exactly what we share in our programs.